True to my word, I’m making a bit of a weekly feature of old pictures. This week I’ve got three lost shops, and a group shot of a youth club. If you have any you’d like to share – no matter how trivial you think they are – please contact me at BrownhillsBob at Googlemail dot com. Cheers. A wider angle of Cunnington's store, featured here a couple of weeks ago. Reader Howmuch was quite right, Corn's chip shop was next door. I love the dog, left of shot, and note the buildings in Clayhanger Road are still extant today. 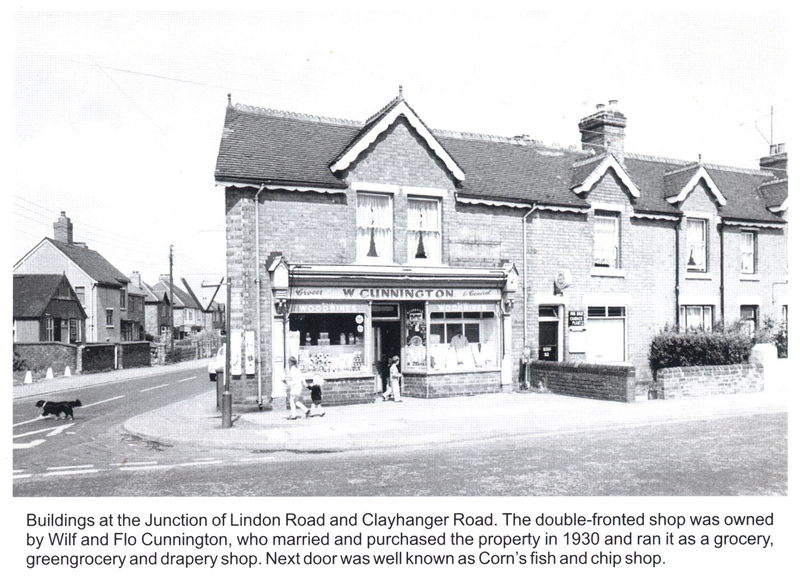 From 'Memories of Brownhills Past' by Clarice Mayo & Geoff Harrington. Read the original post featuring Cunningtons here, and read what reader [Howmuch?] had to say here. I think most of us of a certain age remember Joe's in Brownhills High Street - not as the book says, a cafe, but a sweet shop and tobacconist. They had a fantastic range of ice cream in exotic flavours, and they sold fireworks around bonfire night. Lote's, of course, was the rather dark jewellery shop, and just out of shot, next door, was I believe the Ash & Nephew off-license. From 'Around Pelsall & Brownhills' by David F. Vodden. I remember this store, but not terribly well. I think it was near the Central Cafe in High Street. I'd say this was sometime in the eighties, as the phone number starts 37… but £12.50 for a bed seems rather cheap. From 'Around Pelsall & Brownhills' by David F. Vodden. This is an interesting shot. 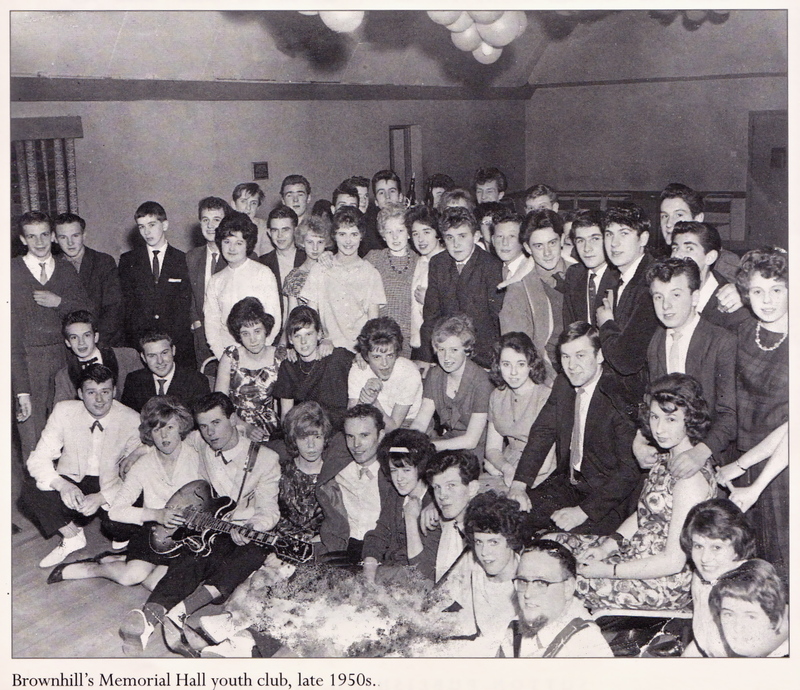 Were you one of these fifties Memorial Hall youth club kids? Some great suits & dresses, combined with some classic period hairstyles. That guy in the foreground with the glasses has on wicked beard. From 'Around Pelsall & Brownhills' by David F. Vodden. This entry was posted in Brownhills stuff, Clayhanger stuff, Environment, Followups, Fun stuff to see and do, Interesting photos, Local History, Local media, Reader enquiries, Shared media, Shared memories and tagged Around Pelsall & Brownhills, Brownhills, Brownhills Bargain Centre, Brownhills local history, Brownhills Memorial Hall youth club, Clarice Mayo, Clayhanger, Clayhanger Lane, Cunningtons, David F. Vodden, Geoff Harrington, JC Lote, Joe's, Linden Road, Local History, Memories of Brownhills Past, New Photos. Bookmark the permalink. Your pic of Joe’s and J. C. Lote reminded me that Lotes used to be on the corner of High Street and Ogley Road (opposite side to the Warreners Arms) and it was the last of the Victorian buildings to be knocked down when they built the recently demolished maisonettes (our family used to live in them). Joe’s was a favourite shop to buy a mixed bag of sweets for a halfpenny. Oops – showing my age now, so I’ll shut up!! Can anyone remind me of the name of the toy shop that used to be just down from Joe’s on the High Street. I was talking about it to my wife only a few weeks ago and had remembered the name but I can’t remember again now. 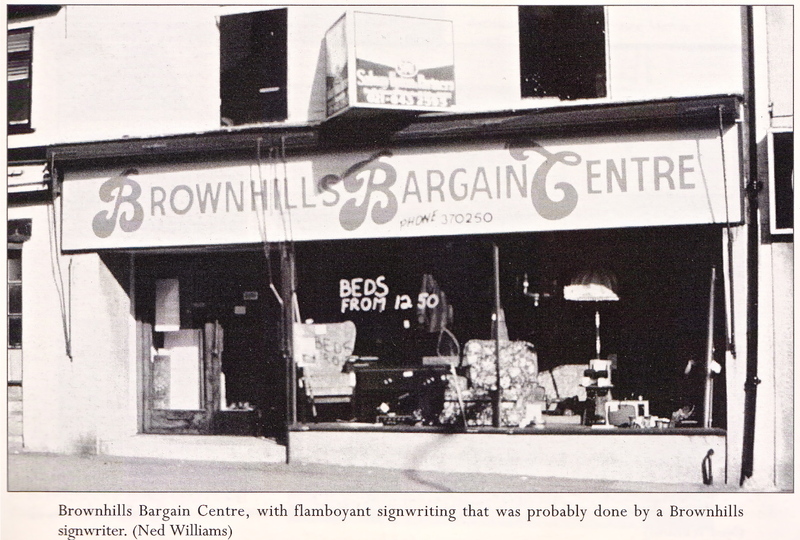 Oh my goodness….I remember Brownhills Bargain Shop in the High street, and I even remember seeing the ‘Beds for 12,50’ notice in the window…! Great blog …thanks…! Hi I use to live on the flat above a cafe (rickets cafe) in fact i was born there in 1957. Does any one know who lived above the other shops next door either side of any of the shops.Then we moved in to the maisonettes you mentioned about 1960. Any one help. My mate Paul Clegghorn (cleggy) his mum had Joes for years when they moved to Portsmouth it went down the tubes. The picture of the youth club! I have seen this picture somewhere as being in St James youth club. Memory! how can you remember faces but not names? I knew the face of the guy with the beard, but still cannot remember his name along with some of the others. I think it’s fairly positively in the memo, but never take captions in books as gospel. Over the years I’ve found a fair few duds, so anything is possible! Hi,remember Joe’s I did a paper round for them, I loved there penny mix. Lotes, I had ears perised there for my 11th brithday back in 1971. 10p to get in and 10p for a bag batter bits from the chippy on the Lichfield rd. 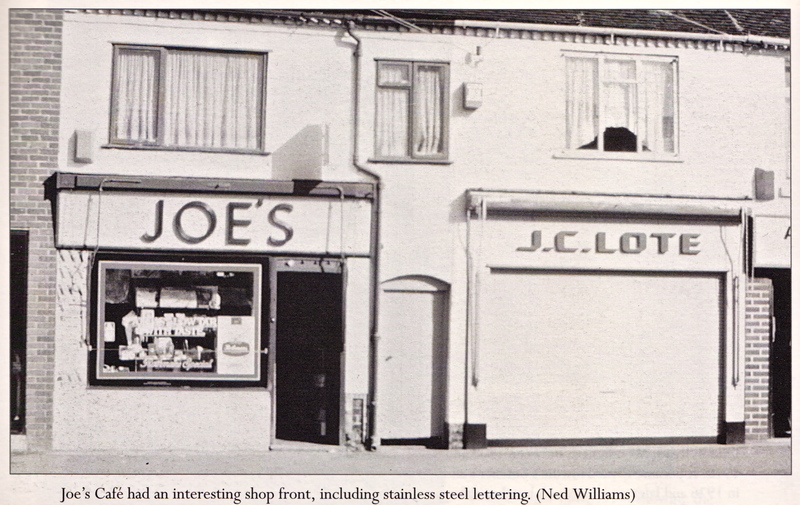 My Grandad opened Joe’s – his name was Joe Millette – did you do a paper round for him?